A little housekeeping first. All PIF posts are going to be cross-posted here and on Emily’s blog (and are written by both of us together). They will appear every two weeks; each post will include a list of resources, our personal perspectives, and an assignment. The whole programme (seven topics) will run over three months, so if you work through it, you could have a published pattern by summer, or (since the last topics cover marketing and business questions) even sooner. We want to be clear that we are not professional coaches and this is not intended to be a professional coaching programme. We want to share our experience and opinions, and direct you to the many excellent resources available to help you get started in design (which include brilliant professional coaching!). There is a lot of help out there; we are here to help you find what you need. So let’s get started. You already have some self-published patterns but want to get your name in front of a new audience. Your idea is likely to evolve as you go – don’t submit to a magazine unless you are sure you can deliver what you’ve pitched! initial swatches to try out any stitch patterns and experiment with transitions between them. These don’t tend to be big, and I often rip them out if they aren’t working. If I have a yarn similar to what I intend to use for the final project then I will also try to work out what needle size to use. 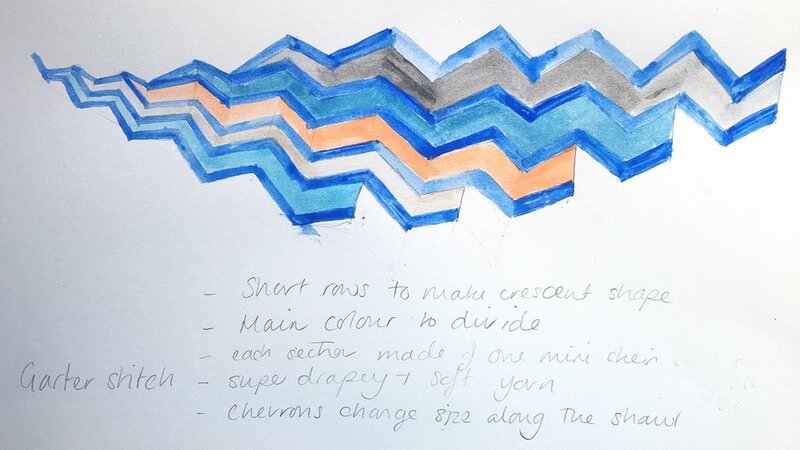 At this stage it is really important to keep detailed notes and sketch out charts of any lace pattern that you are using! You can never ever take enough notes.